Tick is the common name for any of the small, bloodsucking, parasitic arachnids (class Arachnida) in the families Ixodidae (hard ticks) and Argasidae (soft ticks), as well as the family Nuttalliellidae that contains but one known species, a rare tick. These families belong to the subclass or order Acarina (or Acari), a taxon of arthropods (phylum Arthropoda) that is comprised of the larger ticks and the minute mites. All ticks are ectoparasites (external parasites), living by hematophagy on the blood of animals, including mammals, birds, and occasionally reptiles and amphibians (Newton 2007; Jones et al. 2007). Ticks generally are differentiated as "mite-like arachnids," but the term mites sometimes is treated as the general term for members of Acarina and ticks as a subgroup of large, parasitic mites (Newton 2007). Ticks are important vectors of a number of diseases, including Lyme disease. There is an important common element in avoiding such tick-borne diseases: personal responsibility. This personal responsibility extends to methods of prevention of being preyed upon by ticks and to proper removal and consulting a doctor should a tick be found attached to one's skin (or consulting a veterinarian if the tick was removed from a pet). The arthropod class Arachnida, to which ticks belong, is a largely terrestrial group that also includes spiders, mites, scorpions, and harvestmen (daddy longlegs). Arachnids are characterized by the possession of a two-segmented body, a pair of jointed appendages on each segment, and an exoskeleton. The two-segmented body is made up of a cephalothorax and an abdomen, the cephalothorax being derived from the fusion of the cephalon (head) and the thorax. Arachnids belong to the subphylum Chelicerata, a group that receives its name from pointed appendages that grasp the food in place of the chewing mandibles most other arthropods have. The chelicerae serve to macerate food particles. Members of Arachnida may be easily distinguished from insects (class Insecta) by the fact that arachnids have no antennae and no wings and arachnids have eight legs whereas insects have six. Ticks and mites belong to the arachnid taxon Acarina or Acari. Most acarines are minute to small (e.g. 0.08–1.0 millimeters (mm), with adults of most species in the range of 300 to 800 micrometers in body length (Thomas 2007). However, the largest Acari (some ticks and red velvet mites) may reach lengths of 10–20 mm, with the biggest ticks larger than the smallest spiders. Ticks generally are larger than the minute mites. The life cycle of ticks includes four stages: egg, larva, nymph, and adult. Male tick size comparison to a match. As members of Arachnida, ticks should have a segmented body with the segments organized into two tagmata: a prosoma (cephalothorax) and an opisthosoma (abdomen). However, like mites, only the faintest traces of primary segmentation remain in ticks, with the prosoma and opisthosoma insensibly fused. Ticks, like most other arachnids, typically have eight legs but may have six depending on their developmental stage. The major families of ticks include the Ixodidae or hard ticks, which have thick outer shells made of chitin, and Argasidae or soft ticks, which have a membraneous outer surface. A third family, Nuttalliellidae, contains one rare African species, Nuttalliella namaqua. Nuttalliella namaqua is a tick found in southern Africa from Tanzania to Namibia and South Africa, and which has been placed in its own family. It can be distinguished from ixodid ticks and argasid ticks by a combination of characters including the position of the stigmata, lack of setae, strongly corrugated integument, and form of the fenestrated plates. The smaller and more diverse mites (which can be free-living) can be considered any members of Acarina that are not ticks; that is, those in other Acarina families. However, while most authorities differentiate ticks as "mite-like" arachnids, some authorities treat ticks as large, parasitic mites, utilizing the term mites as the general name for all members of Acarina (Newton 2002). All ticks are blood-feeding parasites. Soft ticks typically live in crevices and emerge briefly to feed, while hard ticks will attach themselves to the skin of a host for long periods of time. Ticks often are found in tall grass and shrubs where they will wait to attach to a passing host. Physical contact is the only method of transportation for ticks. Ticks do not jump or fly, although they may drop from their perch and fall onto a host. Changes in temperature and day length are some of the factors signaling a tick to seek a host. Ticks can detect heat emitted or carbon dioxide respired from a nearby host. They will generally drop off the animal when full, but this may take several days. Ticks have a harpoon-like structure in their mouth area, known as a hypostome, that allows them to anchor themselves firmly in place while feeding. The hypostome has a series of barbs angled back, which is why they are so difficult to remove once they have penetrated a host. Tick bites look like mosquito bites, but can also sometimes bruise or resemble a bullseye. An adult female tick drops off her final host, lays her eggs, and dies. Tiny six-legged larvae congregate on grasses or other leaves and stems not far from ground level. Lucky individuals complete that stage after attaching to a host, feeding, and dropping off. The larval stage can cause intense itching on humans, but does not transmit disease. Larvae molt and emerge as the nymph stage, about 1.5 mm long and again climb a grass stem to await a host. The nymph stage also causes intense itching in humans. Engorged nymphs drop off, molt to the adult stage, approximately 3 mm long, mate, and again climb a stem to await a host. Adults are amazingly stealthy on humans in spite of their size, and may not be noticed until they have been attached for a considerable time. Ticks reproduce sexually, use internal fertilization, and are oviparous. Ticks produce a lot of young but the young are not nurtured by the parents. 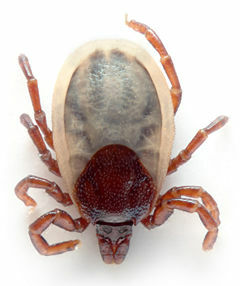 Carios kelleyi, a species of soft tick. Ticks are second only to mosquitoes as vectors of human disease, both infectious and toxic (Edlow 2005). Hard ticks can transmit human diseases such as Lyme disease, Rocky Mountain spotted fever, tularemia, equine encephalitis, Colorado tick fever, and several forms of ehrlichiosis. Additionally, they are responsible for transmitting livestock and pet diseases, including babesiosis, anaplasmosis, and cytauxzoonosis. Soft ticks transmit tick-borne relapsing fever spirochetes such as Borrelia turicatae, Borrelia parkeri, and Borrelia hermsii. Generally, tick-borne diseases correspond to a specific tick-host combination, and are limited in their geographical extent. For example, nearly 90 percent of all Lyme disease(caused by the Borrelia burgdorferi bacterium) cases have been reported in the Northeastern part of the United States (RIDOH 2006a); only specific deer ticks carry that disease (RIDOH 2006b). According to the Rhode Island Department of Health, roughly 70 percent of people who develop Lyme disease in that part of North America catch it from ticks in their own yard (RIDOH 2006c). The West Coast, although originally identified as a focus of Lyme disease, has traditionally been viewed as having minimal tick infection rates. In the past, it was believed that the role of the Western Fence Lizard in the California tick life cycle produced adult tick infection rates of only 2-3 percent. However, a landmark study in 2003 published in the Journal of Medical Entomology included the report that the minimum infection rates of the microbe Borrelia burgdorferi in the tick Ixodes pacifica were much higher in Santa Cruz County, up to 17.8 percent in The Forest of Nisene Marks State Park. This completely transformed traditionally held views of Lyme disease in California as a minimal risk and instead raised the specter of rampant mis-diagnosis as the reason for the lower case numbers. Engorged deer tick attached to back of toddler's head. Adult thumb shown for scale. 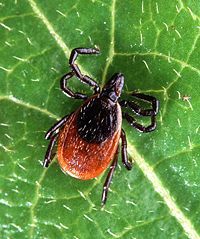 The blacklegged or deer tick (Ixodes scapularis) is a major vector of lyme disease on the east coast of North America. On the west coast, the tick responsible for spread of the disease is Ixodes pacificus (Western black-legged tick). In Europe, Ixodes ricinus, known commonly as the sheep tick, castor bean tick, or European castor bean tick is the transmitter. The deer tick is dependent on the white-tailed deer for successful reproduction. In the fall, large acorn forests attract deer and mice infected with B. burgdorferi, which is the bacteria that primarily causes lyme disease in eastern North America. During the following spring, the ticks lay their eggs. Tick eggs hatch into larvae, which feed on the mice, thus infecting the larvae. The infected larvae molt into "nymphs" (the ticks' "juvenile form"). Infected nymphs feed on humans from spring through summer, thus transmitting the bacteria to people. It is the nymphs that transmit the disease to humans, not the adult tick. Note: On the west coast, Lyme disease is spread by the western black-legged tick (Ixodes pacificus), which has a different life cycle. As the primary host for the adult deer tick, deer are key to the reproductive success of the tick (Stafford 2004). By reducing the deer population back to healthy levels of 8 to 10 per square mile (from the current levels of 60 or more deer per square mile in the worst affected areas of the country) the tick numbers can be brought down to very low levels, perhaps too few to spread tick-borne diseases. Numerous studies have shown that abundance and distribution of deer ticks are correlated with deer densities (Stafford 2004; Rand et al. 2004; Walter et al. 2002; Wilson et al. 1990). For example, when the deer population was reduced by 74 percent in a 248-acre study site in Bridgeport, CT, the number of nymphal ticks collected at the site decreased by 92 percent (Stafford 2004). Furthermore, the relationship between deer abundance, tick abundance, and human cases of Lyme disease was well documented in the Mumford Cove Community in Groton, Connecticut. The deer population in Mumford Cove was reduced from about 77 deer per square mile to about 10 deer per square mile after 2 years of controlled hunting. After the initial reduction, the deer population was maintained at low levels. Reducing deer densities to 10 deer per square mile was adequate to reduce by more than 90 percent the risk of humans contracting Lyme disease in Mumford Cove (Kilpatrick and LaBonte 2002). Deer population management appears to be a key tool in any long-term strategy to reduce human incidences of Lyme disease (Telford 1993). A method of reducing deer tick populations in terms of rodent vectors involves utilizing biodegradable cardboard tubes stuffed with permethrin-treated cotton. It works in the following way. Mice collect the cotton for lining their nests. The pesticide on the cotton kills any immature ticks that are feeding on the mice. It is important to put the tubes where mice will find them, such as in dense, dark brush, or at the base of a log; mice are unlikely to gather the cotton from an open lawn. Best results are obtained with regular applications early in the spring and again in late summer. The more neighbors who also use Damminix, the better. Damminix appears to help control tick populations, particularly in the year following initial use. Note that it is not effective on the West Coast. A potential alternative to Damminix's permethrin is fipronil. It is used in the Maxforce Tick Management system, in which fipronil is painted onto rodents visiting the plastic baitboxes. However, in 2005, there were selective reports of gray squirrels "chewing" into some Maxforce TMS boxes in areas of the northeastern United States, compromising the child resistant box. Due to this problem, the Federal Environmental Protection Agency (EPA) asked that all similarly designed TMS boxes applied in 2006 be covered with a protective shroud capable of preventing squirrel damage. The Maxforce TMS system remains registered by the federal EPA for its continued use. A metal shroud has been developed and is reportedly in use to eliminate any potential squirrel damage to the plastic box. This shroud reportedly satisfies the EPA's mandate to protect the boxes from such damage. The parasitic Ichneumon wasp Ixodiphagus hookeri has long been investigated for its potential to control tick populations. It lays its eggs into ticks; the hatching wasps kill its host. Another "natural" form of control for ticks is the Guinea fowl. They consume mass quantities of ticks. Just 2 birds can clear 2 acres in a single year. However, they can be quite noisy, and employers of this method should be prepared for complaints from neighbors. Topical (drops/dust) flea/tick medicines need to be used with care. Phenothrin (85.7 percent) in combination with Methopren was a popular topical flea/tick therapy for felines. Phenothrin kills adult fleas and ticks. Methoprene is an insect growth regulator that interrupts the insect's life cycle by killing the eggs. However, the US EPA has made at least one manufacturer of these products withdraw some products and include strong cautionary statements on others, warning of adverse reactions. The best prevention for tick-born diseases involves avoiding areas in which ticks are found. Other good prevention practices include wearing protective, light-colored clothing that covers the entire body when in a wooded area, including long pants tucked into socks and a hat; using mosquito/tick repellent; after exposure in wooded areas, check all parts of the body (including hair) for ticks (Jacobs 2003). A vaccine against a North American strain of the spirochetal bacteria was available between 1998 and 2002. The manufacturer pulled the vaccine from the market, citing poor sales; however, there had been hundreds of reports of adverse side affects from patients that may have contributed to the vaccine's withdrawal (Abbott 2006). There are many urban legends about the proper and effective method to remove a tick. One legend states that something hot (a cigarette or burnt match for instance) should be applied to the back of the tick, which causes the tick to remove its head from the victim. Another legend is that ticks "screw" their heads into their victims; therefore, one must "unscrew" the head. These legends are incorrect and dangerous. For proper removal of a tick, use a pair of tweezers, grab the head of the tick, and pull it out slowly and steadily. There are a number of manufacturers that have produced tweezers specifically for tick removal. 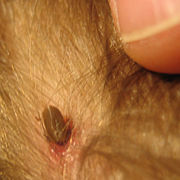 If the head is not completely removed, local infection of the person/animal bitten may result, and a doctor should be consulted (or a veterinarian if the tick was removed from a pet). Tiny larval ticks can usually be removed by carefully scraping with a fingernail. Lyme disease found in deer ticks cannot be transmitted once the body is removed even if the mouthparts break off and are still in the skin. Prompt removal is important; infection generally takes an extended period of time, over 24 hours for Lyme disease. An effective method involves carving the end of a small stick into a flat blade resembling a screwdriver, but with a small notch in the end. This implement is especially useful removing ticks from dogs. Crushing or irritating the tick (by heat or chemicals) should be avoided, because these methods may cause it to regurgitate its stomach contents into the skin, increasing the possibility of infection of the host (Jacobs 2003). An alternative method, used by fishermen and does not risk squeezing the tick's thorax, uses 18 inches of fine weight fishing line. The line is tied in a simple overhand knot that is tightened slowly around the tick's head. If the line is pressed against the skin while gently pulling, the knot will tighten around the tick's head. Slowly pulling the ends of the line will then dislodge the tick from the bite site with a reduced chance of leaving the head attached. This method also works with sewing thread. It is commonly claimed that petroleum jelly placed on the tick will clogs the animal's breathing passages and cause it to de-attach itself. However, many medical authorities advise against this and other "smothering" approaches as ticks only breathe a few times per hour and feeding may thus continue for some time, and because these approaches may irritate the tick to the point of regurgitation of bacteria into the bloodstream (CSMCH 2006; Gammons and Salam 2002). Dermacentor variabilis, the American dog tick, is perhaps the most well-known of the North American hard ticks. This tick does not carry Lyme disease, but can carry Rocky Mountain spotted fever. Ixodes scapularis (formerly Ixodes dammini), known as the black-legged tick or deer tick, is common to the eastern part of North America and is known for spreading Lyme disease. Ixodes pacificus, the Western black-legged tick, lives in the western part of North America and is responsible for spreading Lyme disease and the more deadly Rocky Mountain spotted fever. It tends to prefer livestock as its adult host. In some parts of Europe, tick-borne meningoencephalitis is a common viral infection. Australian tick fauna consists of approximately 75 species, the majority of which fall into the Ixodidae, hard tick, family. The most medically important tick is the Paralysis tick, Ixodes holocyclus. It is found in a 20-kilometrt band that follows the eastern coastline of Australia. As this is where much of the human population resides in New South Wales, encounters with these parasites are relatively common. Although most cases of tick bite are uneventful, some can result in life threatening illnesses including paralysis, tick typhus and severe allergic reactions (USDME 2006). Abbott, A. 2006. Lyme Disease: Uphill struggle. Nature 439: 524-525. PMID 16452949. C. S. Mott Children's Hospital (CSMCH). 2006. Tick bites. McKesson Corporation. Retrieved October 18, 2007. Edlow, J. A. 2005. Tick-borne diseases. emedicine.com. Retrieved October 18, 2007. Fivaz, B., T. Petney, and I. Horak. 1993. Tick Vector Biology: Medical and Veterinary Aspects. Springer. ISBN 0387540458. Gammons, M., and G. Salam. 2002. Tick removal. American Family Physician. Retrieved October 18, 2007. Jacobs, S. 2003. Four common ticks of Pennsylvania: Tick-borne diseases and prevention, tick distributions, life histories and control. Pennsylvania State University. Retrieved October 18, 2007. Jones, S. C., R. E. Gary, M. K. Daniels, and S. W. Chordas. 2007. Ticks. Ohio State University. Retrieved October 17, 2007. Kilpatrick, H. J. and A. M. LaBonte. 2002. Managing urban deer in Connecticut. Hartford, CT: Connecticut Dept. of Environmental Protection, Bureau of Natural Resources-Wildlife Division. Muma, W. 1997. Lyme disease: Nature class. Wildwood Survival. Retrieved October 17, 2007. Newton, B. 2007. Kentucky mites and ticks. University of Kentucky Entomology. Retrieved October 17, 2007. Rand, P. W., et al. 2004. Abundance of Ixodes scapularis (acari:Ixodidae) after complete removal of deer from an isolated offshore island, endemic for Lyme disease. Journal of Medical Entomology 41:779-784. Rhode Island Department of Health (RIDOH). 2006a. Lyme disease. Rhode Island Department of Health. Retrieved October 18, 2007. Rhode Island Department of Health (RIDOH). 2006b. Ticks and Lyme. Rhode Island Department of Health. Retrieved October 18, 2007. Rhode Island Department of Health (RIDOH). 2006c. Lyme disease: Keeping your yard tick-free. Rhode Island Department of Health. Retrieved October 18, 2007. Stafford K. C. 2004. Tick management handbook: An integrated guide for homeowners, pest control operators, and public health officials for the prevention of tick-associated disease. New Haven, CT: The Connecticut Agricultural Experiment Station. Telford, S. R. 1993. Forum: Perspectives on the environmental management of ticks and lyme disease. Pages 164-167 in Howard S. Ginsberg, Ecology and Environmental Management of Lyme Disease. New Brunswick, N.J. Rutgers University Press. ISBN 0813519284. Walter, W. D., et al. 2002. Evaluation of immunocontraception in a free-ranging suburban white-tailed deer herd. Wildlife Society Bulletin 30: 186-192. Wilson, M. L., et al. 1990. Microgeographic distribution of immature "Ixodes dammini" ticks correlated with deer. Medical and Veterinary Entomology 4:151-159. University of Sydney, Department of Medical Entomology (USDME). 2003. Ticks. Department of Medical Entomology, University of Sydney. Retrieved March 14, 2006. This page was last modified on 2 April 2008, at 17:46.